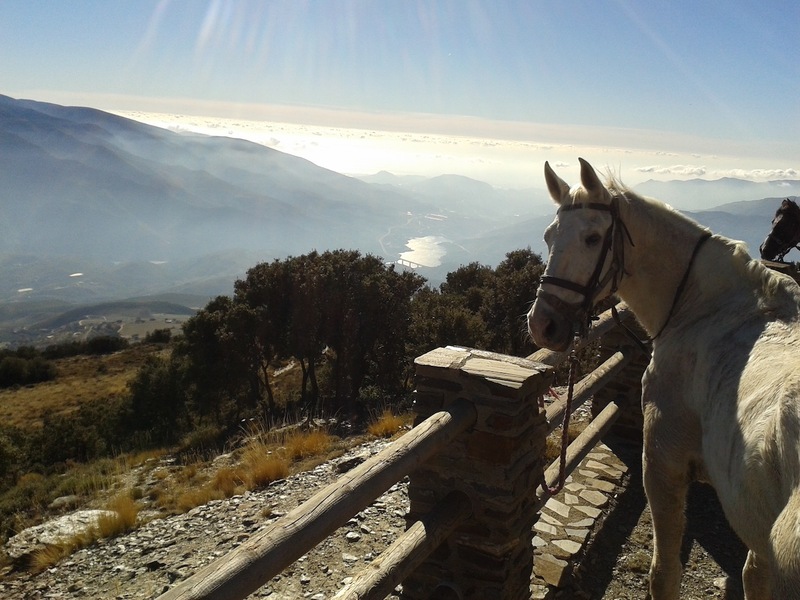 People come to Las Alpujarras in Andalucia for many reasons: to walk, birdwatch, go skiing higher up in the Sierra Nevada, or pop to the beach for the day. Another reason is to go horse riding and there can be few places more beautiful to go trekking than here. 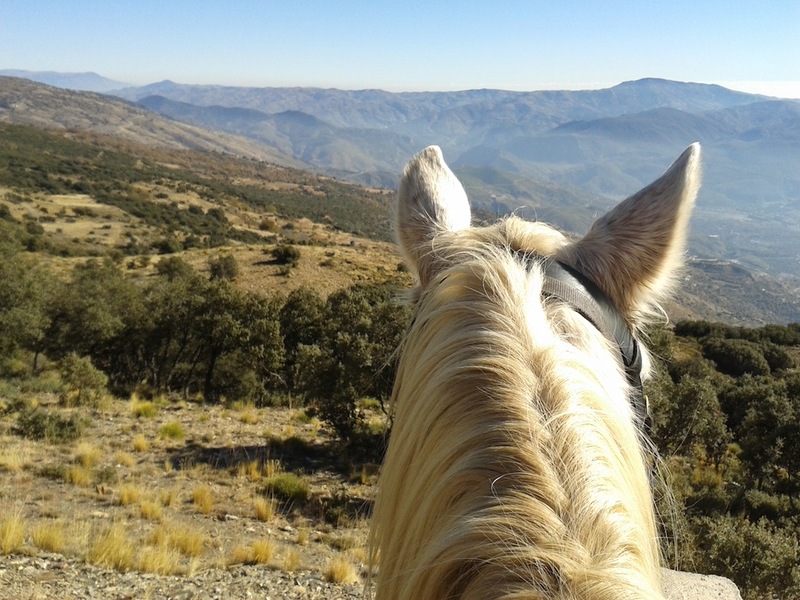 We don’t ride ourselves but a friend who came to stay – Zainab, who lives in Granada – loves it. Staying with us for the weekend she went trekking at the Caballo Blanco centre. Instructions were given to head for the cavernous Venta el Buñuelo restaurant on the main road between Órgiva and Lanjarón, and then find a turn-off nearby. ‘The beautiful, but bumpy, 15-minute drive uphill from Lanjarón brings you to the centre. The journey provides stunning views, but the road may be challenging for nervous drivers – like my mother, who avoids motorways and anything that isn’t a perfect road! The place offers a range of treks and lessons suitable for complete beginners to competent riders – anything from one hour to seven days. I opted for a three-hour ride at a fast pace with leader Amy. It cost €50. My horse, Flicka, had spirit and has won many local races. After walking uphill and ensuring the horses were warmed up, we cantered along the straight stretches of track, stopping before the hair-pin bends. After some fantastic canters we completed our climb at a gentle pace until reaching a flat track on the edge of the national park. We dismounted to let the horses have a break, with oranges for a snack. From here the village of Cañar could be seen to our left and Órgiva sat in the heart of the valley below. The dramatic mountains appeared veiled with a blue mist and the distant sea just visable between a gap. The descent took an hour and we left the road where possible to avoid meeting any of the over-excited locals on dirt bikes who seem to pay no attention to horses. 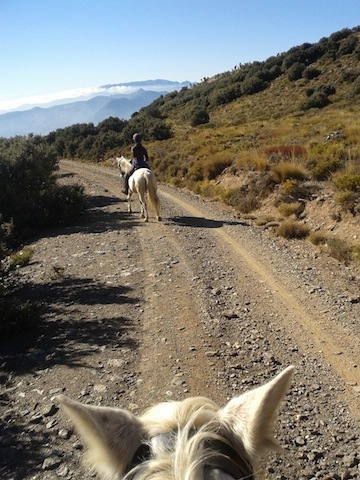 As well as Caballo Blanco there’s at least one other horse riding centre – this one based in Bubión: Spain Horse Riding. All about Granada, Órgiva, La Alpujarras, Las Alpujarras, Andalucia, Spain – tapas, history, local guides and more.